Jonathan Trott will miss the remainder of the domestic season and Warwickshire's CB40 final with Hampshire on 15 September at Lord's. The England batsman, 31, suffered an undisplaced fracture in his right hand in Sunday's fourth one-day international with South Africa. The Warwickshire player was hit by a Dale Steyn bouncer on Sunday but made 47 in England's six-wicket win. 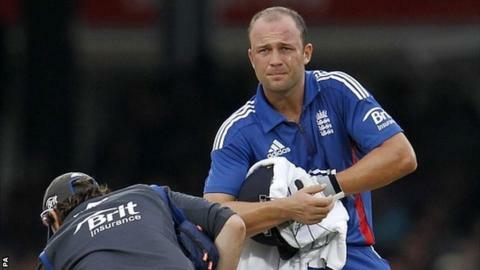 Trott should be fit for for England's tour of India in November. Although initial X-rays looked positive, a subsequent MRI scan revealed a fracture at the base of the third metacarpal in Trott's hand. Trott was England's second-highest run scorer in the series behind Ian Bell before missing Wednesday's fifth one-day international, with 142 runs at an average of 47.33. England play three Twenty20 matches against South Africa before the defence of their ICC World Twenty20 crown in Sri Lanka this month, but Trott would not have featured regardless of the injury. Instead he will miss Warwickshire's final County Championship game against Nottinghamshire at Trent Bridge which begins on Tuesday, 11 September and the CB40 decider four days later. Trott should be able to resume batting within three to four weeks, making him available for England's four-Test series in India which begins on Thursday, 15 November.